very intriguing. It is about the birth of Omat’s, the main character. We are in the land of ice with an extended family of Inuit. It is a time of gods and legends. Omat will become a shaman like Ataata, her grandfather. With these powers she can talk to and see the gods. However when they stop listening to her why is it that a number of gods continue watching her with such interest? There are a number of characters in this book from the extended family group, some Vikings, some animals and the gods however the main character is Omat. She is physically female but she is treated by her immediate family as a boy. This leads to some real gender confusion. There are laws and taboos which Omat will break and there may well be consequences. I really did find Omat an outstanding character who will live in my mind for some time to come I’m sure. While the setting for The Wolf in the Whale is largely the frozen north I found that the landscape did not dominate. The book is descriptive in some ways as the sense of isolation of the small extended family group is powerful. In general when I am reading a review book I try and make notes as I go along. In this case I did find that hard as I simply wanted to keep reading! I guess if I do have a slight reservation the pace in this is a little variable. However few people will find it easy to stop reading during the last 20% or so. 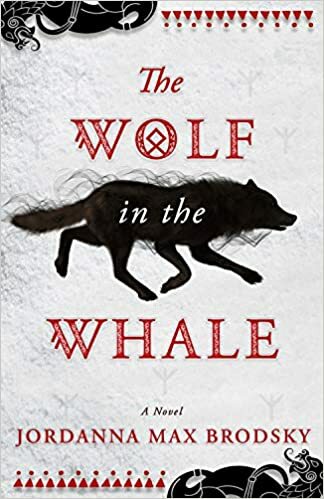 For me The Wolf in the Whale is cleverly worked story telling. The weaving of the day to day Inuit world and their gods with Vikings and their gods is very well done. As is so often the case beware of gods and their tricks… This book also works in the power of stories themselves and I love that approach. I would suggest that, while Neil Gaiman’s American Gods is very different in some ways, fans of his book might well enjoy this one. Whatever else it is a book I really enjoyed and one of the best books I’ve read in the past year (2018).